Traditionally, colostrum is considered the “first food” of newborns because it is easily digestible and enhances the immune system. More recently, colostrum has been shown to regulate the immune system and provide vital growth and healing factors. An optimally functioning immune system prevents unwanted toxins and molecules from disturbing the body’s natural homeostasis. Colostrum naturally contains immune factors, amino acids, nucleotides and growth factors which provide several benefits to human immune health by functioning against pathogenic organisms. There are five main immunoglobulins, but the most common is IgG, which accounts for 75-80% of all serum antibodies in the body. IgG plays a major role in immune system function, as it defends the body against foreign substances. IgG Protect’s pure and high concentration formula provides improved immune modulation and strengthens the gut-immune barrier. Consistency in potency and purity of colostrum extracts is a primary concern for clinicians. Advanced filtration and purification techniques make IgG Protect a superior clinical tool. IgG Protect provides 1,000 mg of IgG and 1.75 g of protein per serving. I can't say this is the only reason, but after taking this product along with other recommendations from the doctor, my IgA went from so low that it was unmeasurable, to just above the highest reference range. It took several months but it works! The immunoglobulin and growth factors in colostrum extract can promote passive immunity, or the transfer of immunity from one organism to another. 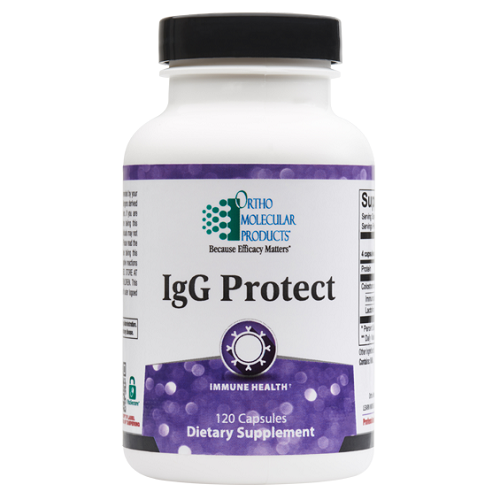 IgG Protect’s pure and high concentration formula provides improved immune modulation and strengthens the gutimmune barrier. Consistency in potency and purity of colostrum extracts is a primary concern for clinicians. Advanced filtration and purification techniques make IgG Protect a superior clinical tool. IgG Protect provides 1,000 mg of IgG and 1.75 g of protein per serving. Traditionally, colostrum is considered the “first food” of newborns because it is easily digestible and enhances the immune system. More recently, colostrum has been shown to regulate the immune system and provide vital growth and healing factors. An optimally functioning immune system prevents unwanted toxins and molecules from disturbing the body’s natural homeostasis. Colostrum naturally includes immune factors, amino acids, nucleotides and growth factors which provide several benefits to human immune health by functioning against microorganisms. There are five main immunoglobulins, but the most common is IgG, which accounts for 75-80% of all serum antibodies in the body. IgG plays a major role in immune system function, as it defends the body against foreign substances. Research has shown that IgG can be effective in neutralizing microorganisms found in the gastrointestinal tract. Colostrum not only includes high quantities of IgG, but also several factors that may positively impact the immune system. Many studies note the use of bovine colostrum to enhance passive immunity to prevent immune challenges, especially when entering by way of the gastrointestinal tract. Lactoferrin, which is naturally occurring in IgG Protect, is an iron-binding glycoprotein, that facilitates iron absorption and protects against harmful microorganisms. Lactoferrin modulates cytokine release, and its receptors have been found on many immune cells, including lymphocytes, monocytes, macrophages and platelets. PRPs are signaling peptides produced by activated macrophages and the T cells that control the production of all cytokines. PRPs have the unique ability to modulate the immune system by increasing activity level in case of certain challenges and decreasing activity level when health is maintained. PRPs are the main regulators of cell protein synthesis and convey appropriate cell functions. 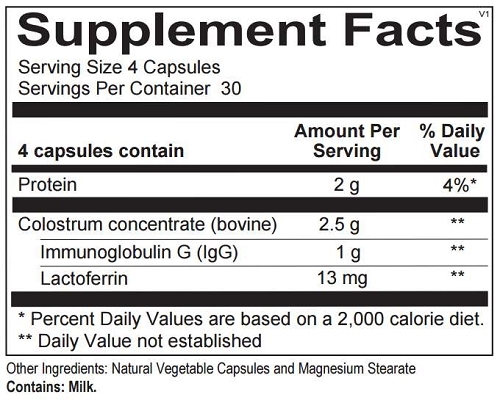 Growth factors in colostrum extract, including several growth factors, such as insulin-like growth factor -1 and 2 (IGF-1 and IGF-2) and transforming growth factor-beta 2 (TGF-ß2) function to stimulate the growth of the gut. They have also been shown to affect rates of protein synthesis, protein degradation and DNA synthesis. In addition, TGF -ß2 may be beneficial in reducing gut permeability and enhancing cell rejuvenation. Sialic acid is an essential component of glycoproteins, which may function to influence brain growth, enhance learning ability and memory formation. Sialic acid has been shown to assist in enhancing synaptic pathways. It may also assist in immune regulation when necessary. 2. Schaller J.P., et al. Prevention of human rotavirus-induced diarrhea in gnotobiotic piglets using bovine antibody. J Infect Dis 1992, 165, 623–630. 4. Arnold R.R., Brewer M., Gauthier J.J. Bactericidal activity of human lactoferrin: sensitivity of a variety of microorganisms. Infect Immunol 1980;28:893–8. 6. Keech A., Buhmeyer J.I., Kolt R. 2008. The Role of Colostrum Proline-Rich Polypeptides in Human Immunological and Neurological Health. Proceedings of Light-Activated Tissue Regeneration and Therapy Conference. Springer US. 233-243. 7. Francis G. L., et al. (1988). Insulin-like growth factors 1 and 2 in bovine colostrum. Sequences and biological activities compared with those of a potent truncated form. Biochemical Journal, 251(1), 95–103. 8. Morgan B., Winick M. Effects of administration of N-acetylneuraminic acid (NANA) on brain NANA content and behavior. J Nutr 1980;110:416–24. 9. Schauer R. Sialic acids:Chemistry, metabolism and function. Wien, NY: Springer-Verlag, 1982.